Slotland's 18th birthday continues this week with a birthday present for us players -- a brand new slot game! 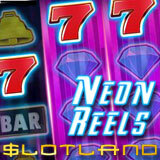 The new Neon Reels is a 5x4 slot with two new bonus features: Wild Reels and Free Spins with Clone Reels. Until Tuesday, you can get an up to $100 freebie (no deposit bonus) and a generous match bonus to check it out for yourself. Bronze VIPs are eligible for a $50 freebie, Silver for $75 and Gold for $100. Neon Reels casino bonuses are available until October 18th only. Freebies and bonuses are available to try new game until October 18, 2016 only. Neon Reels is a five reel slot with four rows, giving more possibilities for winning combinations than a standard 3 row game. Its minimum bet is just 20 coins ($0.20) and the maximum bet is 2000 coins ($20.00). With a 5X win multiplier, five Diamond symbols pay 2500X the bet. At any time (except during free spins) some reels may randomly turn into Wild Reels as they spin. Reels two and four can be filled with Wild symbols; the middle reel can become all Double Wild Symbols, doubling the payout for winning combos. Three, four or five Free Spins symbols trigger five, ten or fifteen Free Spins with Clone Reels. During these free spins, two or more reels always spin simultaneously. One reel is copied to the others and is spun as a single reel. Free Spins symbols appearing during a free spin trigger additional free games. Entertaining players all over the world since 1998, Slotland has been giving away birthday freebies and match bonuses all month and next week players will get an email with more freebies and up to 200% match bonuses.